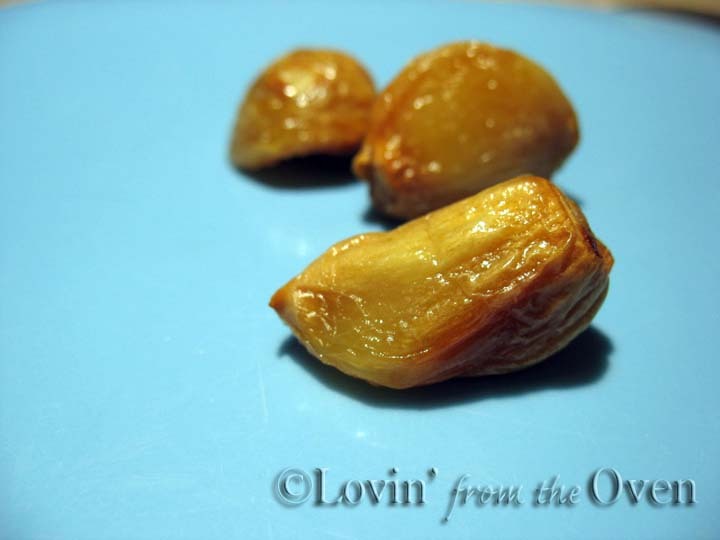 Roasted garlic imparts a deeper, sweeter, and more mellow flavor that I have grown to love. Typically, whole heads of garlic are roasted in an oven that can take anywhere from 45 minutes to an hour. This method, found at King Arthur Flour, takes only around 20 minutes and yeilds more garlic than the whole head method. 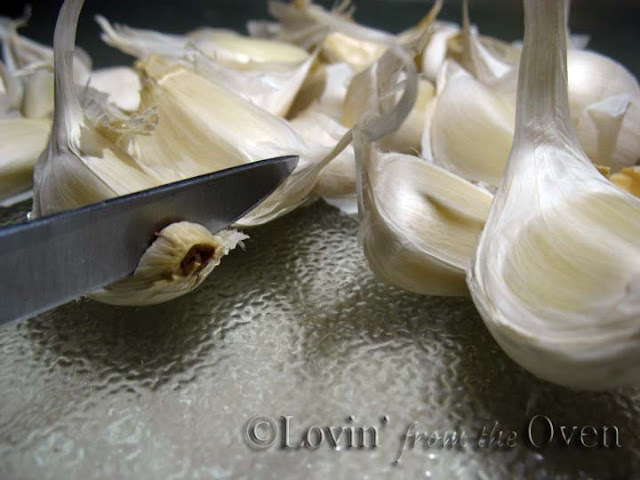 First, break apart your head of garlic into separate cloves. Trim the woody end and discard. 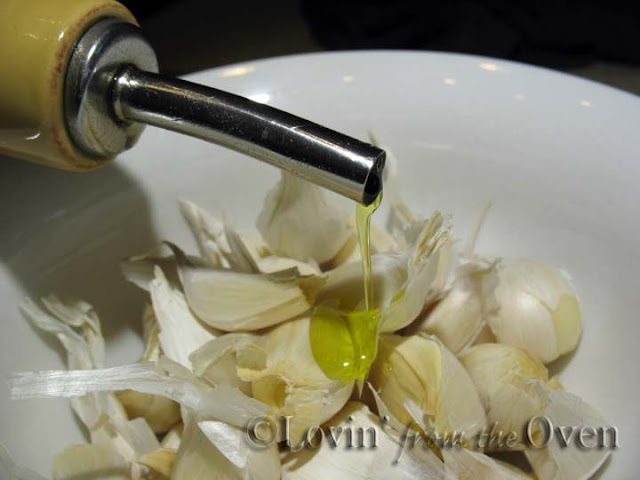 Place the cut garlic cloves in a bowl and drizzle some olive oil, giving it a stir to lightly coat them. 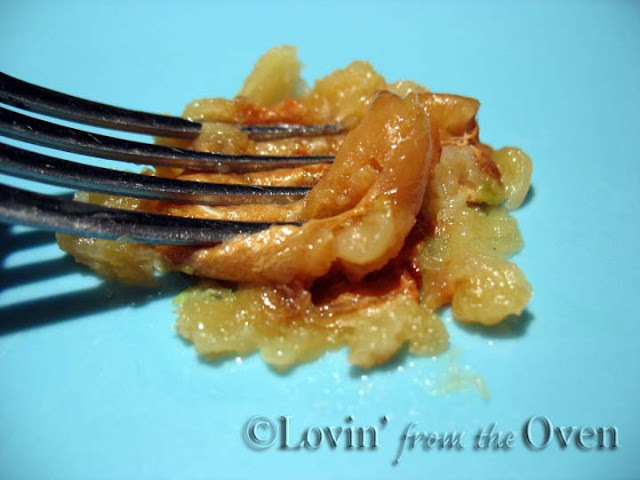 Place the oil drizzled cloves onto a baking sheet and stick them into a preheated 325ºF oven. 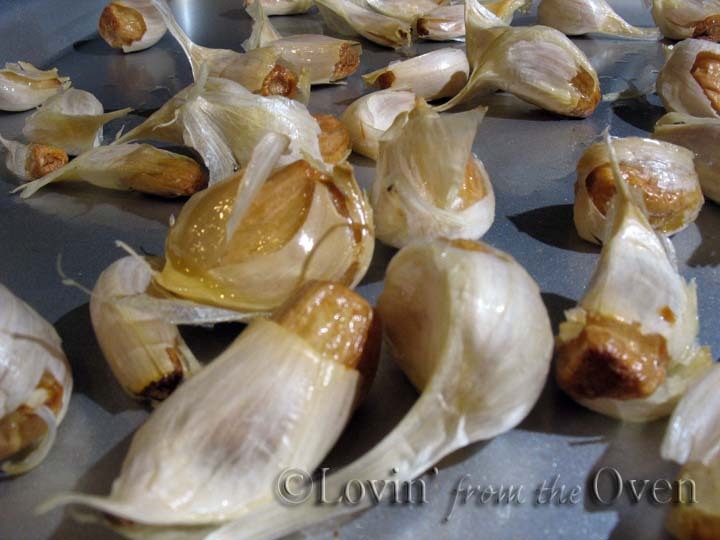 I freeze the roasted garlic in their skins, so they are ready to use any time! When I'm ready to use them, I simply slide the skins off, mash them, and they are good to go. Roasted garlic is great in mashed potatoes, salad dressing, turkey, soups, pasta and in bread! What is your favorite way of using garlic? You can freeze roasted garlic? Good to know - and with the holidays coming up, that would sure come in handy. I just discovered your site a few weeks ago and I love it! 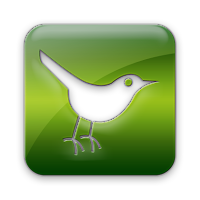 You are now bookmarked for regular reading. Right up there with Smitten Kitchen and Pioneer Woman. Anyway, back to the question. I love roasted garlic on hot, toasted baguette with butter. Yummy. Thanks, Nella ~ your comment has made my day! I have to agree with Nella too. If I'm pushed for time and can only read a couple, yours is one of two or three I try to always see. I have a quick question. When freezing the garlic (brilliant idea, by the way) why freeze with the skins on? I thought they would be much easier to peel/squish out while warm. Diane, I keep the skins on as a matter of preference. An extra skin to keep the freezer elements away from the garlic is not a bad idea, 'eh? The skins come off VERY easily, even on frozen raw garlic. On the frozen raw garlic, I just trim the woody end and the skins just slip off. I need to add one note: Frozen garlic has a tendency to become stronger over time. If you use a lot, great! If not, just start with less garlic than stated in the recipe. Thanks for being a faithful reader ~ I try to learn something new and pass it along! Love the peel-free idea. 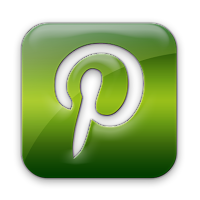 Will definitely try this - Thanks Frieda! I love your tips! This will make roasted garlic so much easier! And, I didn't know that you could freeze them! Thanks! !